Altar, Catholic, Church of the Apostles, column, finials, Gothic, Gothic Revival, lancet window, Launceston, Alexander North, pointed arch, spire, stained glass, Tas, Tasmania, tracery, Bishop Willson, Robert William Willson. This elaborate altar is in the Catholic Church of the Apostles is in the Tasmanian city of Launceston. The foundation stone was laid in 1864 by Tasmania’s first catholic Bishop, Robert William Willson (1794-1866). The altar is in the sanctuary designed by Alexander North (1858-1945) and built in 1886. The altar is topped by a spire and is in the Gothic style, with prominent decorated pointed arches, columns, and finials. 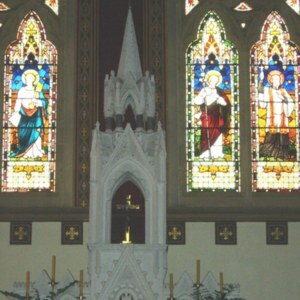 Behind the altar are the two stained glass east windows, both of which consist of two lancet windows and tracery, with additional glass above. “Church of the Apostles Altar, Launceston, Tasmania,” Medievalism in Australian Cultural Memory, accessed April 23, 2019, http://ausmed.arts.uwa.edu.au/items/show/1207.